How have ecosystems changed over the last few decades and how will they continue to change in a future warming world, and how well can we capture these changes from satellite measurements? How interconnected are deep and surface communities, do they have differing levels of vulnerability, and how are they changing in relation to each other? What are the regional variations in vulnerability of the marine ecosystems? How can we best determine and quantify ecological vulnerability metrics using a combination of ocean color imagery and a numerical model? Characterize spatial and temporal variability of satellite-estimated optical properties and satellite-derived products including backscattering, absorption coefficients, Chl, particle size-spectrum, phytoplankton functional type and size. Test the algorithms underpinning the satellite-derived products using the “synthetic data” of the ocean model, where both radiative fluxes and properties of the water column are known. Qualitatively and quantitatively evaluate the performance of the global simulations of ocean plankton and optical properties using the remote sensing reflectance and other diagnostic products from remote sensing. Use the ocean simulations and simpler theoretical explorations to interpret the physical-biological mechanisms underpinning regional, seasonal and inter-annual changes in the character of plankton populations. Examine the implications of the observed and simulated ecosystem variability for biogeochemical fluxes, including carbon cycling and air-sea exchange. A detailed, mechanistic understanding of the uptake of carbon by the ocean is required to monitor changes in the ocean carbon sink, and to predict its future change. The sinking of biogenic particles from the surface ocean and their remineralization at depth constitutes the “biological pump” portion of ocean carbon sink and is determined, in large part, by the phytoplankton community size structure of the surface ocean. Previous studies suggest that satellite-retrieved chlorophyll concentration and primary production are not enough to predict changes in the removal of organic material from surface waters and its fate at depth, yet these have been the only satellite-derived variables available to us until very recently. 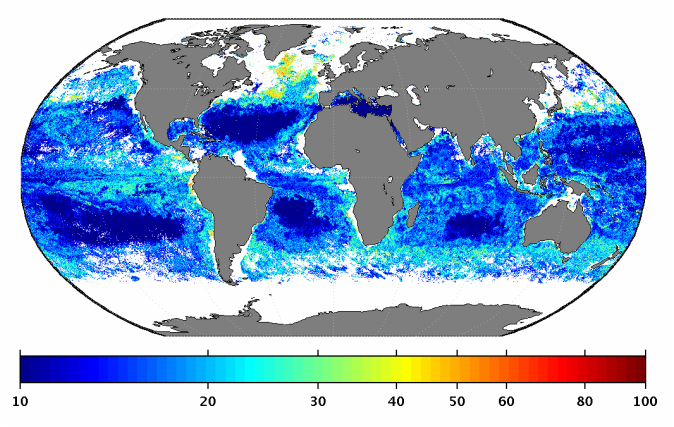 This project aims to make additional progress by taking advantage of recent satellite-derived retrievals of phytoplankton size distribution (percent microplankton, Sfm) that have been shown to have high fidelity for the global ocean (Mouw and Yoder, 2010). Numerical models of the global ocean ecosystems have typically had only a fixed number of phytoplankton species and a few pathways for production of particulate detritus that then sinks and remineralizes at fixed rates. A novel self-organizing ecosystem model (Follows et al. 2007), the “Darwin model”, has many tens to hundreds of phytoplankton species and so can capture more accurately the evolving distribution of the phytoplankton community. This model will be an ideal testbed for assessing the importance of phytoplankton community size structure to the biological pump. Do satellite retrievals of the phytoplankton size structure improve empirical algorithms for the export of biogenic particles from the surface ocean and their remineralization at depth? How does variability in surface ocean phytoplankton size structure impact the biological pump of carbon to the deep ocean? The nature and extent of changing sea ice over the Bering Sea shelf and the timing of its retreat have a profound impact on the timing and nature of the spring phytoplankton bloom. However, there is little knowledge of community compositional variability of the phytoplankton blooms and how the zooplankton community may respond or be impacted by such changes. The overarching goal of this study is to understand the response of phytoplankton and zooplankton communities to changing ice dynamics in the Bering Sea. This project (1) integrates ship measurements of phytoplankton species composition, their size structure and productivity to understand the potential consequences on zooplankton populations measured from moored acoustical observations, (2) integrates ship-based observations of size structure and photo-physiological properties of phytoplankton with optical measurements to refine satellite algorithms for the retrieval of phytoplankton size composition, chlorophyll concentration, and primary production and (3) utilizes in situ observations and satellite observations of ocean color and of sea-ice conditions to improve modeled physical, biogeochemical and ecosystem dynamics. What are the dominant physical and chemical ice-mediated controls on phytoplankton community structure and size fractionated productivity; how are these controls changing with decreasing sea ice extent and concentration? How do zooplankton size and community structure vary with sea ice mediated changes in bloom timing? Is there a clear relationship between phytoplankton bloom dynamics and community composition, zooplankton biomass and community structure and sea ice dynamics, how have these changed over our data record and how may they change in the future?